U.S. stocks gained fractionally on Friday, but not enough to finish positive last week as investors remain cautious about interest rates and hopeful on corporate earnings. Earlier in the week, Wall Street saw the 10-year Treasury spread over 10-year TIPS, a proxy measure of consumer prices, expand to 1.69%, the most since May. Meanwhile, Wednesday’s release of the minutes from the Fed’s September FOMC meeting revealed that policymakers remain committed toward raising rates this year. However, on Friday, Fed Chair Janet Yellen said that there are “plausible ways” that running the economy hot for a while could repair some prior recession damage. Third quarter earnings season got off to a rocky start, however several major large-cap banks posted results topping forecasts. For the week, the S&P 500 fell -0.95%, capping its first pair of weekly declines since August, while the Dow Industrials lost 102-points (-0.56%), and the MSCI EAFE (developed international) declined -1.40%. 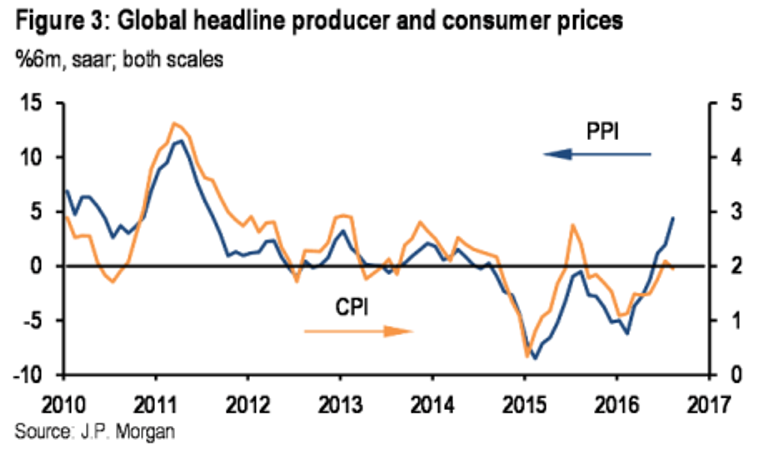 As the global inflation chart from JPMorgan (above) shows, consumer and wholesale prices are now on the rise in most corners of the world. This past week’s Producer Price Index (PPI) reports from the U.S. and China point to a rapid shift away from deflation at the wholesale level. Global consumer price inflation is moving more slowly, but JPMorgan forecasts the global cost-of-living index (CPI) to increase cumulatively by 1%—to about 2.5%—by mid-2017. The responses to this from the three-largest world economies (G-3) have varied, reflecting their divergent business cycle positions (visible in core inflation) and institutional constraints. The U.S. Federal Reserve appears to be debating how far to push the limits of the Phillips curve** by running a “high pressure” labor market at the same time that the European Central Bank and Bank of Japan are displaying acceptance that inflation will stay below target for longer. ** The Phillips curve is a historical inverse relationship between rates of unemployment and corresponding rates of inflation that result in an economy. Stated simply, decreased unemployment, (i.e., increased levels of employment) in an economy will correlate with higher rates of inflation.